Article from Fox News by Andrew O’Reilly. Newly empowered Democrats in Washington and statehouses across the country are flexing their legislative muscle with a host of tax proposals that would affect billionaires and blue collar alike. From D.C. to Sacramento, the controversial levies include everything from a “wealth tax” to new charges on ammunition and groceries. Some of these are meant as a deterrent against certain kinds of purchases — like guns and ammo — while others are intended to help pay for ambitious new programs. Massachusetts Sen. Elizabeth Warren, who is about to formally launch her Democratic presidential campaign, has proposed a 2 percent tax on net worth above $50 million and a 3 percent tax on net worth above $1 billion. The proposal is unique in that it targets assets and not income, and has already faced some constitutional questions. While critics also note it would be difficult to enforce since it would require the government to value assets, the proposal would be estimated to affect about 75,000 households. 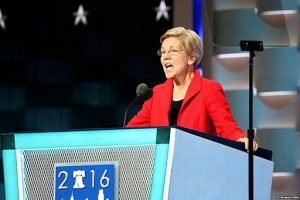 WARREN, ‘SHOULD NEVER, HAVE BEEN ‘ALLOWED’, TO SEEK ANY OFFICE IN THIS COUNTRY! SHE, ‘LIED’, ABOUT HER ANCESTRY-TO GET INTO COLLEGE-FREE, ETC. HOW, COULD ANYONE, ‘ELECT’, SOMEONE, WHO, WAS ‘OUTED’, BY LYING? NOW, ‘SHE’, IS ‘GOING TO RUN, FOR PRESIDENT? WARREN, OCASIO, THE MUSLIM ‘WITCH’/ETC.-SHOULD ALL, BE, ‘ELIMINATED’, FROM ANY & ALL OFFICES, IN THE UNITED STATES GOVERNMENT! THIS, ‘DUE TO, ‘FABRICATION’, MENTAL ‘INSTABILITY’ & ‘TRAITORISM’! Didn’t wed just have an 8 year Commander -in-Chief who had done the same thing? They want to rais Taxes because they have always stolen it for themselves. They are and always have been out for themselves and always will be unless President Trump can put them where they belong and that is in GITMO. Warran provided false information on Federal documents, to be eligible for money and power ( elected position), and that is a federal crime. Had I done that, I would be already in jail ! ! !